Every morning, the fine folks at Sports Radio Interviews sift through the a.m. drive-time chatter to bring you the best interviews with coaches, players, and personalities across the sports landscape. 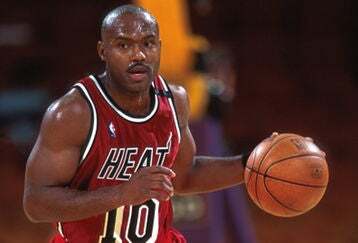 Today: Hardaway minces words. He joined ESPN Radio Chicago to talk about his own experience of making homophobic comments that got him into all sorts of trouble back in 2007, his thoughts on how Noah has handled the media firestorm since then, whether he thinks the whole incident was a distraction for Noah on Tuesday night in the Bulls' tough Game 4 loss, and how he's still suffering the consequences of his offensive comments over four years later. "Well there's a lot of stuff you can say about that. A lot of the stuff that's said is wrong, a lot of stuff that's said is right. I think Joakim Noah did the right thing - he apologized, he took the onus and went on ahead and corrected the whole situation like I did. That's all you can do is correct the situation. You're not trying to hurt anybody, you're not trying to - how would I say it - offend anyone. But you've just got to take the right approach and hold your own self accountable for it and make everything right. And that's all you can do." "Well that was a big distraction for him, but I think he came back [Tuesday] and played a good game, a great game. The outcome wasn't what they expected, but they played a great game. They did what they were supposed to have done; he did what he was supposed to have done. Even though he fouled out, he played his game and helped his team have a chance to win at the end and that's all you can ask for." "Oh it hurt it tremendously, it hurt it tremendously. I'm still trying to rectify it. People come up and ask me about it and I say ‘hey, that's in the past, I'm moving forward.' I'm still learning from it and it's still a bump in the road. But hey, you've got to still move forward and you still got to keep going. And that's the way it is. I take onuses on stuff. I'm not trying to shy away from it, I'm not trying to say I didn't do it. It was me and I'm rectifying it, and I understand exactly what I said and how I said it which was wrong. I'm just trying to move on from it." • Mo Williams has good things to say about Mike Brown. • Bruce Bochy wants a discussion on catcher safety. • Sandy Alderson's not happy about the Mets' payroll.